Published: Jan. 2, 2013 at 06:38 p.m. Updated: Jan. 2, 2013 at 07:14 p.m. The Baltimore Ravens will play host to the Indianapolis Colts this weekend in an AFC wild card game. And while this won't be the first time the Colts have traveled to Baltimore for the playoffs, there is still a certain magic in the air. A new generation of fans probably doesn't even realize the Colts once played in Baltimore, but to some, those wounds still sting. So while many will take the time to breakdown the matchup between Andrew Luck's Colts and Joe Flacco's Ravens, that's not what we do here. Let's take the Baltimore Colts and Baltimore Ravens to the grid! Named after: The Preakness A poem Baltimore Ravens. Previously known as: Dallas Texans (not thoseDallas Texans, and not those Baltimore Colts) Cleveland Browns Baltimore Colts. It's long bothered me the Baltimore fans were so quick to embrace a relocated team when you consider what happened to it. But as Baltimoreans will point out, the Browns got their team back, but still. 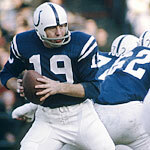 Colors and uniforms: Baltimore Colts. Purple can be a great color scheme, yet the Ravens haven't really found a great use for it. And as Uniform Monitor Dave Dameshek has long pointed, the Ravens' black pants tend to look like tights. Logo: Horseshoe Some sort of crest Baltimore Colts. Long contended this was one of the coolest logos in sports. Simple, yet elegant. Which is the way I'm often described (not really). Cool fact: Marching band! They have a marching band, too! Baltimore Ravens. It was an homage, so that's kind of cool. 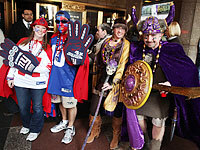 Super Bowl titles: Super Bowl V Super Bowl XXXV Baltimore Ravens. Considered this a push, but the Ravens were more dominating and impressive in their win, while Super Bowl V was considered one of the worst played of all-time. Ray Lewis Baltimore Colts. Obviously this will be split among the generations, but I'm going to default to the NFL Network Top 100 players of all-time list. Unitas ranked No. 6 all-time and Lewis was No. 18. If you're upset, take it up with those voters. 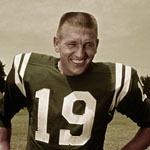 Final sendoff for said face of the franchise: Unitas' regrettable stint with the San Diego Chargers Lewis will hang them up after "one last ride" Baltimore Ravens. Mainly because Lewis won't embarrass himself, and he referenced the Undertaker. Movie based in Baltimore during the team's era: "Diner" "He's Just Not That Into You" Baltimore Colts. Mainly because the Colts were woven into "Diner" in the famed "football test" scene. 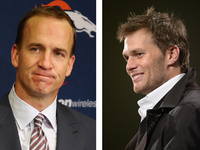 And I've never seen "He's Just Not That Into You," but it's about John Elway and the Colts, right? Tell me they at least reference it..
TV show based in Baltimore during team's era: Uh, were there any? "Maude," maybe? "The Wire" Baltimore Ravens. Some consider "The Wire" the greatest show ever. And no, "Maude" was not set in Baltimore. And if it was, well, "The Wire" would still win. Coaching connection: Ted Marchibroda (1975-79) Ted Marchibroda (1996-98) Push. But do you know the guy Marchibroda replaced during his second stint in Baltimore? Google it. Greatest beating New York moment: Winning the "greatest game ever played" Super Bowl XXXV Baltimore Colts. Did you not see the part where they won the greatest game ever played? The Ravens beat Kerry Collins in the Super Bowl. And if you ever want to get thrown out of a Baltimore tavern, stand on a barstool and yell out: The Mayflower moving trucks are outside are here We got rid of Cam Cameron too soon Baltimore Colts. Seriously, the Elway thing still hurts everybody in Baltimore still. Especially if Elway's Broncos dispatch the Ravens from the playoffs in the second round. All right, let's stop it right there. This one is no contest, the Baltimore Colts win this one going away.